“Start by doing what’s necessary; then do what’s possible, and suddenly you are doing the impossible.” – St. Francis of Assisi, founded the Franciscan Order, patron saint of animals and the environment (1181-1286). Welcome to our Coventry Deanery Website. On this site you will find contact details and links to websites, where they exist, for all the Catholic Parish’s in the Deanery, together with Mass Times and details of our Catholic Schools. Our website brings together the resources of the Coventry Catholic Deanery and provides information about Deanery wide activity. Coventry is one of eighteen deaneries which make up the Catholic Archdiocese of Birmingham. The Coventry Deanery has the following parishes: All Souls, Christ the King and Our Lady of Lourdes with St Augustine’s, Corpus Christi with St Anne’s, Holy Family, Our Lady of the Assumption & St John Vianney, Sacred Heart, St Elizabeth, St John Fisher, St Joseph the Worker, St Mary and St Benedict, St Osburg’s, St Patrick, St Thomas More. Canon Tom Farrell, Dean of Coventry and Parish Priest of Christ the King. This weeks newsletters: All Souls 21&28/4, Christ the King 21&28/4, Corpus Christi with St Anne 21/4, Coventry Ordinariate 21/4, Holy Family 21/4, Our Lady of the Assumption & St John Vianney 21/4, Sacred Heart 21/4, St John Fisher 21/4, St Elizabeth 21/4, St Joseph the Worker 21/4, Ss Mary & Benedict 21&28/4, St Osburg 21/4, St Patrick 21/4, St Thomas More 21/4, University of Warwick 21/4. Easter Monday Mass is traditionally held at St. Osburg’s. Bishop William Kenney will Celebrate the Eucharist along with the priests of the deanery. There will be no morning Masses in the parishes on that day, but the priests will come together with their parishioners to celebrate that Mass at 10.00am on Easter Monday to continue celebrating Easter together as Christians of this city. Diocesan Pilgrimage to Walsingham on 11th May: The Deanery will organise a coach for this Pilgrimage. This will depend on enough people wanting to travel and booking and paying in advance. You can book a place with Christ the King by phoning 024 76 591618 or email: admin@ctk-cov.org.uk. A place can only be guarantee once payment has been received. England to be rededicated as the Dowry of Mary in 2020. Dowry Tour – The Dowry of Mary Pilgrimage Triduum. 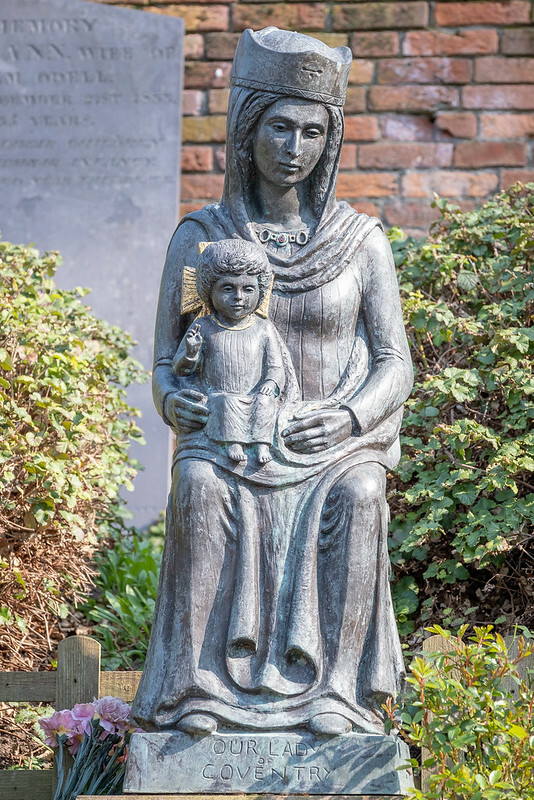 During the course of 2018 to 2020 the statue of Our Lady from the Slipper Chapel at the Catholic National Shrine in Walsingham will be taken to each Cathedral in England for a three-day triduum of prayer, as part of the preparation for the re-dedication of England as the Dowry of Mary in 2020. Each visit will take place between a Thursday and Saturday. “A moment of great promise …. for the Church in this country and for our mission” Cardinal Vincent Nichols website link St Chad’s Birmingham – 20th to 22nd June. Annual St Patrick’s Day Mass: The Annual Mass in honour of St Patrick will be on Thursday 14th March at 8pm at St Mary and St Benedict’s Church. Fr Tom Walton officially takes up residence at St John Vianney Presbytery and the post of Parish Priest for both Our Lady of the Assumption and St John Vianney on Monday 4th March. His First Mass at St John Vianney will be at 9.30am on Monday 4th March. His first Mass at Our Lady of the Assumption will be at 12.10pm on Monday 4th March. Friday 8th February 6pm. Annual Service for Saint Josephine Bakhita at St Chads with his Grace Archbishop Longley. link. We have a Mobile App link you can find it on the Google Play Store link and on the App Store link. You can also search for it or click here. The Church’s in the Coventry Deanery are part of the Archdiocese of Birmingham, Registered Charity No. 234216. This website provides Catholic news, and information. Terms and Conditions, Accessibility Statement, Privacy Notice.